Chittorgarh resonates with stories of Rajputana bravery, pride and passion. The bards of Rajasthan sing tales of courage and sacrifice recounting stories that are known to every child and adult in the city. Chittorgarh is named after its most imposing structure, the Chittorgarh Fort which stands atop a 180 metre high hill and is spread across 700 acres. Chittorgarh Fort has had a tumultuous past. This bastion of the Rajputs has faced violent attacks thrice in its entire history. The first was in 1303 when the Sultan of Delhi, Ala-ud-din Khilji, who was enamoured by Queen Padmini, launched an attack to abduct her. More than two centuries later, in 1533, it was Bahadur Shah, the Sultan of Gujarat, who caused immense destruction. Four decades later, in 1568, Mughal Emperor Akbar attacked and seized the fort. It was finally in 1616, under the rule of Mughal Emperor Jahangir that the fort was returned to the Rajputs. Come explore the wonders and sites that Chittorgarh has to offer you. There’s always something to see in Rajasthan. While it is difficult to arrive at the exact date the fort was established, legend has it that the construction of the Chittorgarh Fort was initiated by Bhim, a Pandava hero from the mythological epic Mahabharata. The fort houses several magnificent monuments, some unfortunately ravaged by time. This palace plays an important role in Rajput history. The structure is built on the banks of a lotus pool and has a pavilion that provides privacy for the women of the royal family. Ala-ud-din Khilji, then Sultan of Delhi, spotted Queen Padmini’s reflection in the pool and was so besotted by her beauty that he led his forces in battle to abduct her. Vijay Stambh (the Tower of Victory) was built by Maharana Kumbha between 1440 AD and 1448 AD to immortalise his triumph of defeating the Muslim rulers of Malwa and Gujarat. Built partly from red sandstone and partly white marble, this architectural wonder is nine-storey tower decorated with detailed sculptures of Hindu gods and goddesses. Narrow steps lead to the terrace where one can catch a spectacular view of the entire town from the balconies. This Tower of Fame is dedicated to Adinathji, the 1st Jain Tirthankara (great teacher). Adorned by the figures of the Digambars (Jain monks), this seven-storied tower was built by a wealthy Jain merchant in 12th century AD. Constructed by Maharana Fateh Singh, this palace functioned as his residence. It was built in the Rajput style of architecture as a declaration of his taste for art and culture. The palace has a vast collection of wood crafts of Bassi village, post medieval statues of Jain Ambica and Indra from Rashmi village, weapons such as axes, knives and ancient shields, clay replicas of regional tribal people clad in their traditional costumes, paintings, and crystal ware. It has now been converted into a museum. The fort of Chittor has six Jain temples contained within its walls. The largest among them is the temple of Bhagawan Adinatha which has 52 ‘devkulikas’. Built in 8th century AD, this ancient structure was initially constructed to worship the sun god. In the 14th century, the temple was dedicated to Goddess Kali, the symbol of power and valour. Tulja Bhavani temple, an architectural wonder, is a Hindu temple of the goddess Durga, built in the 16th century by Banvir. Legend says that it is named after Banvir who donated various ornaments (Tula Dan) equaling his weight for relief funds. Gaumukh Reservoir is a deep tank that is fed by a spring. The spring emerges from a rock formation resembling a Gaumukh or ‘cow’s mouth’. The tank is considered sacred by the locals. The winter palace of the royal family, it overlooks a small lake. Although fairly rundown now, it is an interesting place to explore and attracts many tourists. A ruined edifice of great historical and architectural interest, this is one of the most massive monuments in the Fort of Chittor. The palace is believed to have underground cellars where Rani Padmini and other women committed ‘Jauhar’ (self-immolation). The temple was constructed during the rule of Rana Kumbha and is built in the Indo-Aryan style popular in those times. It bears a strong connection to the mystic poetess Meerabai, a zealous devotee of Krishna’s. She was the wife of Prince Bhojraj. Nagari is a village situated 18 Km North of Chittorgarh, on the banks of river Berach. In the ancient era, it was known as Majhimika or Madhyamika .According to the inscription found in Barli, near Ajmer; in 443 BC, this town was named as Majhimika. It was a flourishing town from the Mauryan period, and remained so up to the Gupta period. The excavations found here are surrounded by many interesting facts and show the signs of strong Hindu and Buddhist influence. A large number of punch marked coins, along with other old coins were also found in the excavations. In the first century, Nagari was ruled by the Sibi tribes. The coins of the Sibi tribe found here have the legend ‘majhamikaya sibi janapadasa’. The Sibi tribes were probably defeated by yavans (Greeks). Patanjali, the contemporary of Pushyamitra Sunga, has mentioned in his Mahabhashya, about the attack of the Yavans (Greeks) on Madhyamika in 150 BC. After then, Nagari came under the influence of the Western Kshatrapa in the 2nd century. In the 3rd century, Nagari was ruled by the Malavas. Later, it was conquered by the Huna king. Major tourist attractions in Nagari include the Ancient Shiva Temple, Hathiyon ka Bara, and Ubhdivat or the Prakash stambh. Bhainsrorgarh Fort is perched on a steep slate ridge, about 200 feet high, surrounded by the Chambal and Brahmani rivers. It is located 235 kilometers north-east of Udaipur and 50 kilometers south of Kota. Upon seeing this grand fort and its fascinating beauty, British historian Colonel James Todd once said that if he was offered a jagir (estate) in Rajasthan and given the option to choose, it would be Bhainsogarh. This fort has a remarkable history, it was built by Rawat Lal singh-II son of Rawat Kesari Singh of Salumber. Bhainsrorgarh was granted to Lalsingh as jangeer by Maharana Jagat Singh II of Mewar in 1741 AD. and there are various legends about this place. But, there is no accurate information about who built the fort and exactly when it was built. However, the Bhainsrorgarh Fort is believed to be built in the 2nd century and there are several folklores about who built the fort. It passed through the hands of several clans before becoming a part of the Mewar Kingdom. It is believed that Allauddin Khilji also attacked this fort and destroyed all the old temples and buildings, that’s why the older history of this fort still remains unknown. Bhainsrorgarh Fort has now been converted into a luxury heritage hotel by the erstwhile royal family. Surrounded by rivers on three sides and nestled among the Aravali ranges and dense forests, the beauty of this fort attracts tourists from all over the world. The ancient temples of Baroli, a wonderful example of Hindu architecture, was built by the Huna rulers in the 9th Century, and is located on the confluence of Brahmani and Chambal rivers in Rawatbhata which is at a distance of 115 km from Chittorgarh district. The main temple in these is the Ghatseshwar Mahadev temple, apart from which there are 9 temples within the temple complex. The Shringar Chauri built opposite to the Ghateshwar Mahadev Temple is the premise of the marriage ceremony of ruler Allaat of Mewar and Huna Princess Hariyadevi. Through this marriage, a connection between the Guilla and the Hunas was established. Located inside the the Chittorgarh Fort, Jaimal and Patta’s Palace is a symbol of the bravery and gallantry of the Rajputs. According to historian Gaurishankar Hirachand Ojha, in 1567, as Akbar’s giant army surrounded the fort of Chittorgarh with an intention to attack the kingdom, the chieftains of Maharana Uday Singh (ruler of the Mewar dynasty, presently Chittorgarh) unanimously decided that it was wise at the moment to send Maharana's family to the hills in the company of some warlords. Following this, the responsibility of protecting the fort was given to Rathod Jaimal and Sisodia Patta. In the war, Jaimal and Patta sacrificed their lives while exhibiting extraordinary valour. Impressed by their fearlessness, Akbar himself ordered the construction of figures of the two brave hearts sitting on their elephant outside the Agra Fort. The statues were later removed by Aurangzeb. In the Chittorgarh Fort, where Jaimal and Patta had lost their lives, one can find a cenotaph made in their honour. 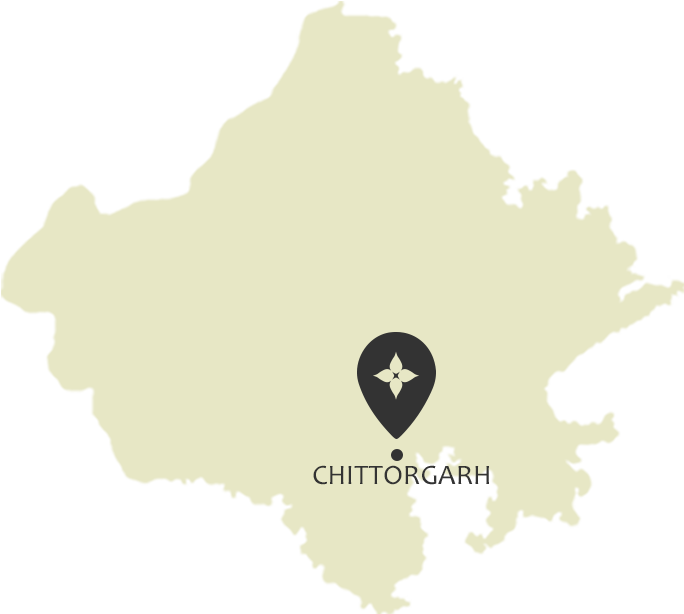 Chittorgarh is a city that resonates with Rajputana pride, passion, and bravery. Full of forts and palaces that let you travel back to the past, Chittorgarh has a number of places of interest that can satisfy a traveler’s soul. One of the lesser known places in the city, Bhamashah ki Haveli elicits a sense of former grandeur that well befits the person it was made for. Bhamashah has held quite an important place in Rajput history, being one of the most well-known ministers to Maharana Pratap. He and his brother Tarachand are well known as warriors of great acumen, having fought a number of battles under MaharanaPratap, including the one at Haldighati. Infact Maharana Pratap ran out of funds for his fight against the Mughals, when Bhamashah and Tarachand gave him their own wealth. Located in front of the topkhana in Chittorgarh, the Haveli has been maintained by the Archeological Survey of India. Surrounded by custard apple trees, there is also a Mahadev temple near the Haveli, and right behind are the Moti Bazaar and Nagina Bazaar as well. At the entrance, you are greeted by a pillared verandah which was most likely used as a place to meet the common folk and guests. Venturing further inside, you can glimpse a number of rooms that rise up to three floors at places. The location of the Haveli is such that it doesn’t see a lot of footfall, but it is one place that is definitely worth a visit the next time you are in Chittorgarh. Be a part of the festivities and traditions that Chittorgarh has to offer. It’s always a celebration in Rajasthan. Engage in the many activities, tours and adventures that await you in Chittorgarh. There’s always something to do in Rajasthan. A trip to Chittorgarh cannot be completed without feeding fish at the Gaumukh Reservoir. A deep tank filled by a spring coming from an opening in the rocks shaped like a gaumukh or 'cow’s mouth', it is considered to be sacred spot. The nearest airport is Dabok Airport in Udaipur city which is about 105 kms away. Regular buses are available to Chittorgarh from all major cities in Rajasthan. Chittorgarh is connected by rail to and from Udaipur, Ajmer, Jaipur and Delhi.